Uveitis is a condition that affects the middle layer of the eye wall, which is called the uvea. When uveitis develops, this area becomes swollen and inflamed. The inflammation can lead to eye pain, red eyes, and vision problems. It is important to get this condition diagnosed and treated as soon as possible by a qualified medical professional because it can lead to permanent loss of vision. If you think you have uveitis, you should see an eye doctor right away for a proper diagnosis. Uveitis and other painful eye conditions can have serious consequences if not treated in a timely manner. Uveitis may be caused by infection, injury, chronic inflammation, or an autoimmune disorder. Typical treatment for recurring uveitis is corticosteroids. Corticosteroid has strong anti-inflammatory properties, but it can also damage the liver and kidneys in the long term and can cause osteoporosis. TheraLife Eye plus Omega-3 Fish Oil is your natural alternative. TheraLife Eye is a proprietary formula that improves blood circulation to the eye and fights inflammation at the same time. It will restore normal eye function, which may have been suppressed by the inflammation caused by uveitis. TheraLife’s molecularly distilled Omega-3 Fish Oil also has strong anti-inflammatory properties to help you recover. 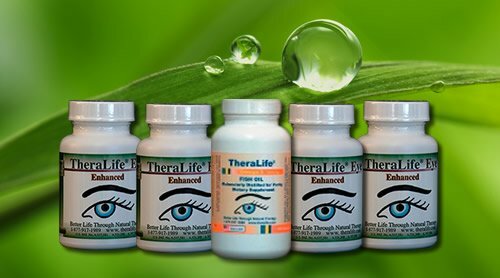 Click here to purchase the TheraLife Eye Enhanced (One Month) Bundle, which includes 4 bottles of TheraLife Eye Enhanced and 1 bottle of Omega-3 Fish Oil. The one month bundle typically retails for $124.85, but you can get it on sale now for the discount price of $115.85. Buy a two or three month bundle and save more! Click here for details.